Stephen began his music career by studying piano, clarinet and saxophone with some of Melbourne’s finest teachers: (Mack Jost, Isobel Carter-Stockight and Peter Clinch). He graduated from the University of Melbourne with a B. Mus. Ed. and, subsequently, from Monash University with a Master of Arts (Music – Hons). From 1980-86 he worked as an Instrumental Music Teacher at various suburban Melbourne High Schools. During the years 1980-88 he played with the RAA 3rd Division Band, specialising on bass clarinet and baritone saxophone. In 1987, he was appointed Head of Woodwind Studies at Yarra Valley Anglican School. During 1989, he was on teacher-exchange as a Band Director to Oconomowoc Senior High School in Wisconsin, USA. While there, he studied conducting with three eminent American professors: Dr. James Smith at the Universities of Wisconsin at Madison; Dr. H. Robert Reynolds – University of Michigan at Ann Arbor; and Dr. Mallory Thomson – University of Florida at Tampa. From 1990 to 1995 he was Director of Music at the Yarra Valley Anglican School. From 1996 he served at Ivanhoe Grammar School in roles that included Head of Music and Head of Performing Arts: Ridgeway Campus. After 23-years service, he retired in December 2018 from his role as Head of Music: Ivanhoe Grammar School, Ridgeway Campus. His conducting activities have involved him with the John Antill Youth Band, the Eastern Youth Laureate Wind Symphony, the Symfonisch Blassorkest Gaanderen, the South-West Region Music Festival, the Geelong Summer Music Camp, and the Australian Band and Orchestra Directors Association (ABODA). He has been the Assistant – Conducting Clinician at two ABODA Summer Conducting Schools. Stephen has been the principal or guest conductor of wind band performances internationally in America, New Zealand, Singapore, China and The Netherlands. He has adjudicated at the Melbourne Schools Band Festival, ABODA festivals, Royal South Street Eisteddfod, Bendigo Competitions Society, the Victorian Bands League and the Victorian School Music Association. 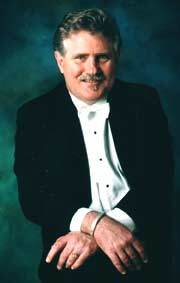 He was founding Director of the Monash University Wind Symphony and was its principal conductor from 1993 to 2001. During his Directorship of the Monash University Wind Symphony this ensemble undertook international tours to Asia. During his various roles as a senior Music Educator he has commissioned several works for student musician ensembles and the Heidelberg Wind Ensemble from composers both Australian and International. These include – Kristin Rule, Jo Selleck, David Keeffe, Franz Cibulka, Yuen hing-Yau, Robert Sanderson, Brian Hogg, John Allan, Joe Chindamo, Benedict Dean-Johns and Onsby Rose. Stephen regularly champions the work of young and talented Australian composers. He is married with two adult daughters. The Heidelberg Wind Ensemble regularly present Australian Wind Band Première performances of the contemporary Wind Band repertoire.